Size: The head and body length is typically between 39.3 and 53.8 cm (15.5 and 21.2 in), excluding tail. Weight: The average masses of the male and the female are 8.89 kilograms (19.6 lb) and 8.8 kilograms (19 lb), respectively. Body: They possess a slim and slender structure entirely covered with long, dense and glossy body hair, giving them an ape-like appearance. Head: The face is rounded with a short and blunt snout area, moderately large nostrils and earlobes, and round eyes. Tail: The tail is very long that measures between 71.0 and 85.5 cm (28.0 and 33.7 in). Sexual Dimorphism: No visible differences between the sexes can be noted. They have been known to live for 22 to 25 years in the wild, and up to 35 years in captivity. 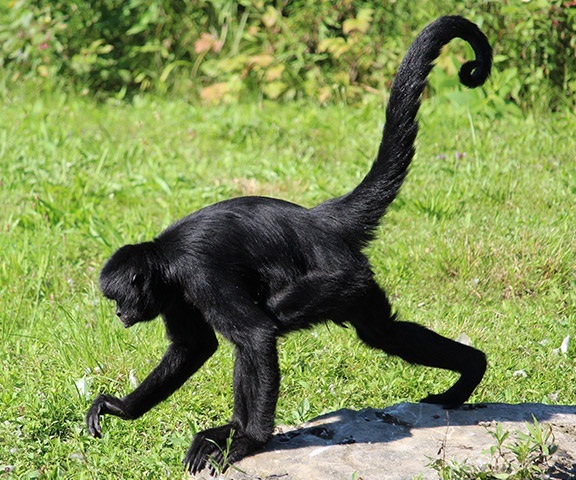 The black spider monkeys are found in the dense rainforests of Central and South America. 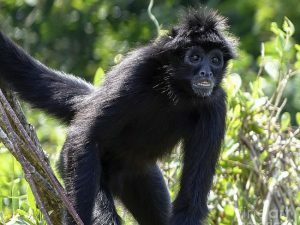 Ateles fusciceps rufiventris – the population to the southwest of Colombia extending to eastern Panama and have an entirely black body hair with some white marks on the chin. 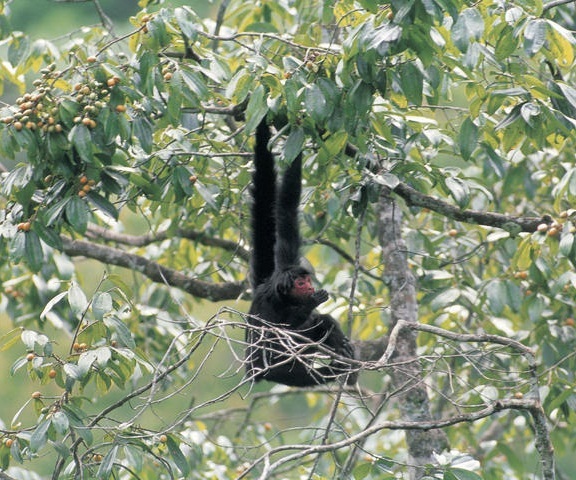 The black spider monkeys are a diurnal species that are primarily arboreal (live in trees). They have mastered the brachiation technique (swinging by the arms from branch to branch) and are excellent climbers as well. Like most other primates, they sleep at night. During the day, they associate with each other in groups comprising of around 20 individuals. The group is rather loosely packed since they are rarely seen gathered in one place. Each group forms a subgroup of different sizes, while they move through the forests using all their four arms. When they walk, they are seen in an upright position along the branches. Their highest recorded speed (leap) is approximately 9 meters (30 ft.). Spider monkeys can emit different sounds and calls to communicate. They can give out sobbing sounds and screams, or even barking noises to alert others or draw their attention for help, if they feel threatened. They are primarily, herbivore, or more precisely, folivore and frugivore, living on especially plant foods including leaves, seeds, grains, nuts, and fruits. However, because they also feed on some animal foods like eggs and insects, occasionally, they are biological omnivores. As the mating season approaches, the female black spider monkeys may move on to consort with a single male partner for up to three days, or else mate with multiple partners. The act of mating takes place with the male and the female facing each other, which might last for five to ten minutes. As the female gets pregnant, the gestation period lasts for 226 to 232 days. After the infant is born, it is taken care of by its parents until it is able to forage for its own food and can become independent. 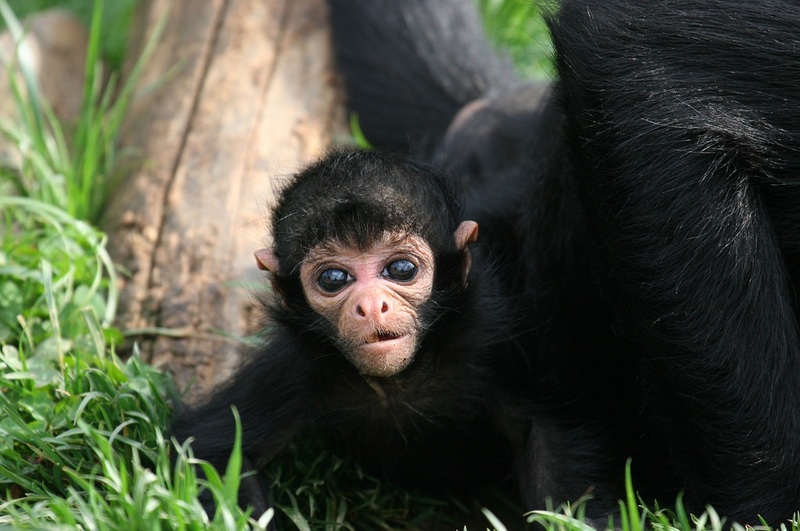 The baby monkey would move with its mother, riding on the latter’s back. This continues for up to around 16 weeks. It takes almost 20 months for the baby to be weaned. 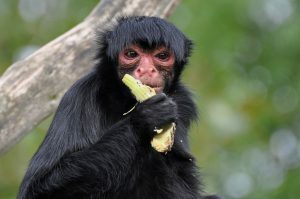 The male juveniles take around 56 months to attain the age of sexual maturity, while the females take around 51 months. 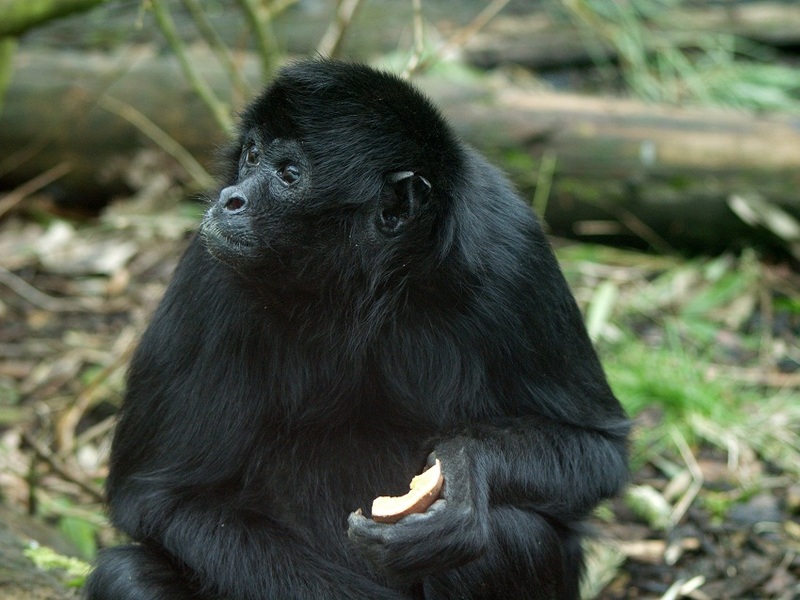 Once matured, the females can give birth every three years. The skull structure is such that they have forward facing eyes. This feature allows them to gauge distances precisely while swinging from one tree to another. The arms are adapted for climbing as they lack thumbs, which increases their strength to grip, helping them with climbing easily. 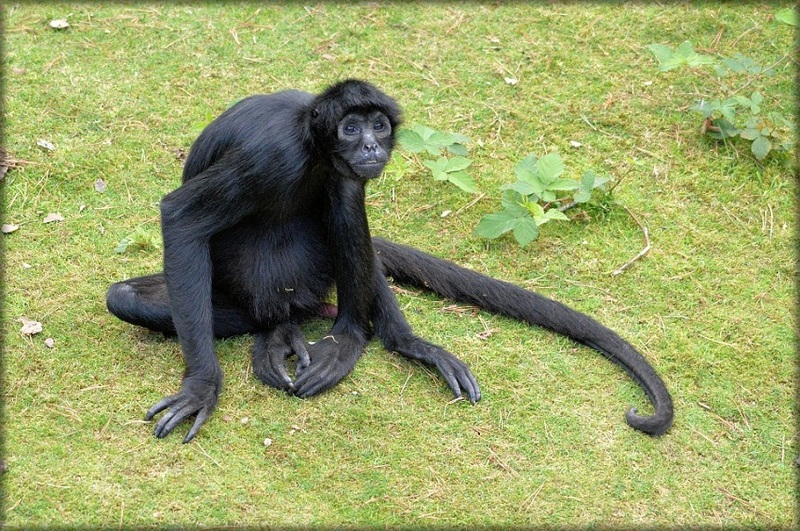 They have a prehensile tail, adapted to grasping or holding, i.e., they have the ability to hang down from the branches with the sole help of their tails. Also, the underside of the tail tip does not have hair, and is ridged and wrinkled, further assisting them in gripping. The primary predators of these primates are pumas, jaguars, large snakes, and ocelots. 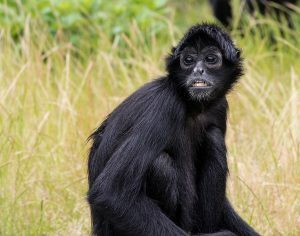 The black-headed spider monkey has been marked as ‘CR’ (Critically Endangered) by the IUCN 3.1 because of their estimated population loss of over 80% in a span of 45 years. They have the strongest tail in the animal kingdom. Black spider monkey gets its name from its ability to hang from the trees with the help of its long tail, much like a spider is seen hanging using its silk. 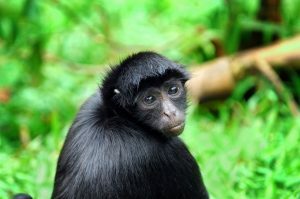 These primates serve an important ecological purpose in South America by dispersing the undigested seeds through their manure, thus sprouting and replenishing the rainforest vegetation.